This bird cage skirt is made of a beautiful sheer material with a quality elastic band at the top and bottom for a perfect cage fit. The skirt will allow you to see your bird and your bird will be able to easily see out of it. It will help to keep your floor clean, is washable, and allows air to flow in and out of the cage. 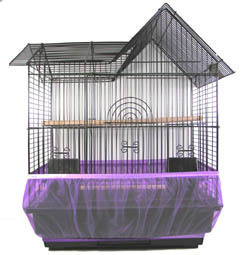 Sheer Guard Bird Cage Skirt - X-Lg: skirt is approximately 12" high and fits cages 70" to 108" in perimeter (around the cage). Notify me when X-Lg Bird Cage Skirt Sheer Guard is in stock.